When I go home in France, there are two things that I have to eat within days that I arrive. A real French croissant, an Opera and either an eclair or a religieuse. Why because they taste like nothing else you can find around here. The only place that I was able to eat true French pastry was in Las Vegas at the Patisserie of Jean-Philippe inside Aria and the Bellagio. But in Spartanburg, Sc, there is nothing like this. So if the craving strikes, and the time is there I can spend time in my kitchen fixing those delightful desserts. This week-end the time was not right, but as I had committed to help with an event, here I was making eclairs. Do you wish to learn to make some??? Call me to find out when my next cooking class on French Eclairs will be at 864-494-4494 or check my website for the cooking classes schedule. For the time being, I will offer you a recipe of the Chocolate Painted Eclairs with the French Vanilla Cream that I use is from the Demarle Cookbook called Les Classiques de la Patisserie. For the choux pastry: 5 cl milk, 5 cl water, 1/8 tsp of salt, 1 tsp of sugar, 3 1/2 Tbsp of butter, 1/2 cup of flour, 2 large eggs. In the saucepan, heat up the milk, salt, and sugar. Add the butter cut up in pieces. When the butter has completely melted, bring the mixture to boil. Remove the pan from the stove and add the flour by stirring very well. Place the pan back on the stove ( it must be turned off, but will still be warm), and stir and stir with a heat-resistant spatula until the dough starts becoming a ball and will no longer stick to the rims of the pan. Remove the pan from the stove and add the eggs one at a time, mixing well after each egg. Place the dough in a pastry bag, with the large circular opening make long sticks of about 5 inches or 2 inches for small ones on a large silpat that you would have previously lay on a large perforated sheet. Sprinkle the eclairs with some confectioner’s sugar and cook them in a warm oven at 350 for 15 minutes for the small ones or about 25 minutes for the large ones. The dough should become brown and dry on all sides. If the dough is a little bit soft, continue cooking the eclairs for 1-3 more minutes. Take them out to cool. Meanwhile, prepare the vanilla cream: 50 cl of milk, 4 oz of sugar, 4 egg yloks, 1 1/2 oz of corn starch, 1 tbsp of vanilla extract, 1/2 cup of heavy cream. In a mixer, place the egg yolks and the sugar, beat the mixture until it doubles in volume and become a pale yellow. Add the warm milk ( that you would have previously brought to boil, or heat up in the microwave), and the cornstarch and stir. Empty the mixture into a medium saucepan. Place the saucepan on the stove over medium heat and stir. The cream will get thicker. Be careful not to burn the cream by stirring constantly until the cream gets thick. Set aside to cool. Prepare the whipping cream by placing the heavy cream into the mixer and beat it until the cream stats forming hard peaks. If the cream is cold, add the whipping cream a little at a time and mix until it is well incorporated. Fill the pastry bag with the cream. To fill up the eclairs, either slice a little hole at one of the extremity of the eclair and fill the eclairs with the cream. An easier way to fill up the eclairs would be to slice the eclairs in their length and fill them up with the cream. 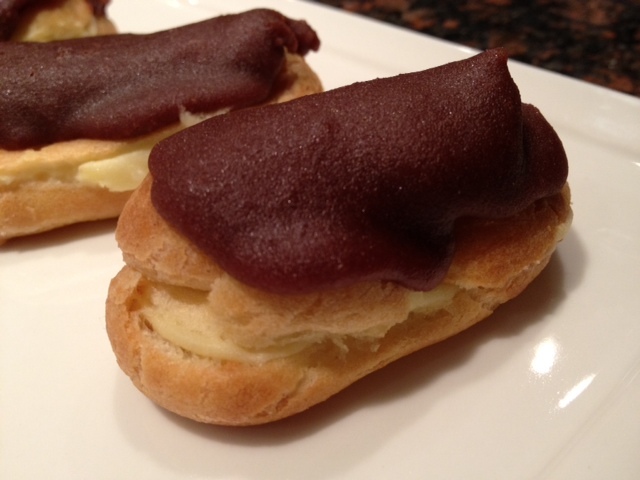 To decorate the eclairs, you will need to make “un glacage”. Most recipe book will tell you to use pre-made fondant. But you can make your own. Chocolate Fondant: 2 cups of confectioner’s sugar, 2 oz of water, 1/3 tbsp of light corn syrup, 1 oz of bittersweet chocolate. In a small saucepan, combine all the ingredients except the chocolate and stir until the sugar is completely melted. Cook until it reaches about 92 degrees. Remove from the stove , add the chocolate and stir. Let the mixture cools a bit but not too much or the fondant will harden and you will not be able to paint the eclairs. 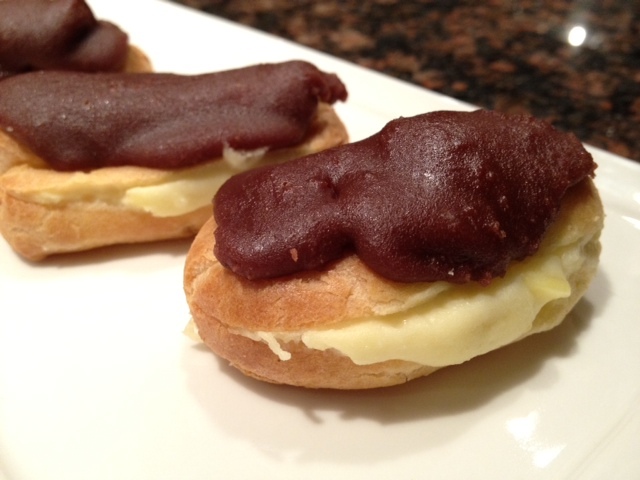 With a pastry brush, paint the eclairs. Et voila!!! YUMMY!!!! I just started following your blog, and your eclairs look delicious. 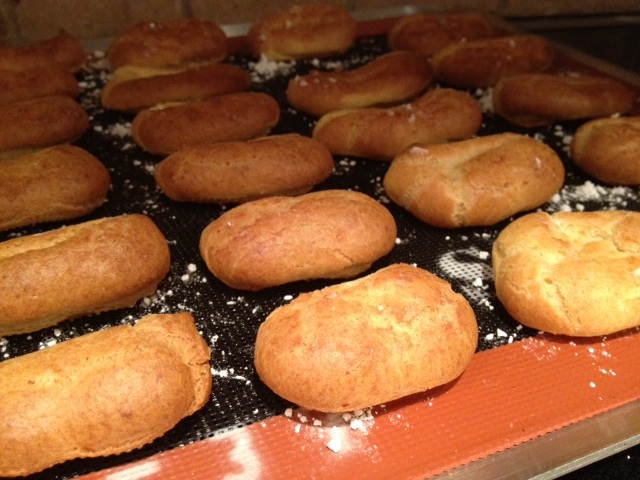 I have been making many gougeres recently (for work), but I must try your eclair recipe. My problem is how do I eat just one?